Community-based palliative care is an essential component of a post-acute care network for seriously ill individuals. Community-based palliative care has been demonstrated to improve all aspects of the Triple AIM, reducing the total cost of care while improving patient outcomes. It is challenging to build a sustainable community-based palliative care program that meets the needs of the community and fits within the organization’s infrastructure. Building a Community-Based Palliative Care Program is a series of online courses created to guide individuals and teams working to develop, integrate, and/or improve a community-based palliative care program. Simply select the course or courses that meet your needs to guide your development process using a step-by-step process. You will get tools, templates and case examples in the engaging, tool-packed self-paced courses, available any time, any place. Enroll in one, as many as you need, or the entire series! Building a budget and business case, attracting payer and provider partners, and launching a community-based palliative care program is a daunting task. Our comprehensive, self-paced online courses provide a detailed process for you and your team to follow from conception through the entire process. Click HERE to get the brochure on this series! Click here to review the list of downloadable tools included within each course in the series. The tools have been tested and used by providers and consultants and are just what you need to guide your development, implementation, and integration process. Enjoy the flexibility! Enroll in one or all of the courses, based upon your organization’s needs. Call to buy the entire series: 760-750-4006. Building a community-based palliative care program is a multi-phased process that involves everything from conducting a needs assessment to developing a budget and numerous steps in between. In addition to building a program, it is essential that organizations spend time and attention working to integrate it into the fabric of the organization. This self-paced online course outlines our ten-step development and integration process, describes the role of the implementation team, and explores the benefits of hiring a consultant to assist in the implementation and integration process. Palliative Care Models incorporates case studies to define and describe the seven predominant palliative care models. Course authors Kathy Brandt, MS and Helen McNeal, BBA, provide detailed information regarding the services typically provided, the typical care setting(s) where each model can be implemented, as well as staffing considerations. You and your team will also learn about the benefits and challenges to continuity of care inherent in each model. Examples of potential organizational partners specific to each model are also provided. 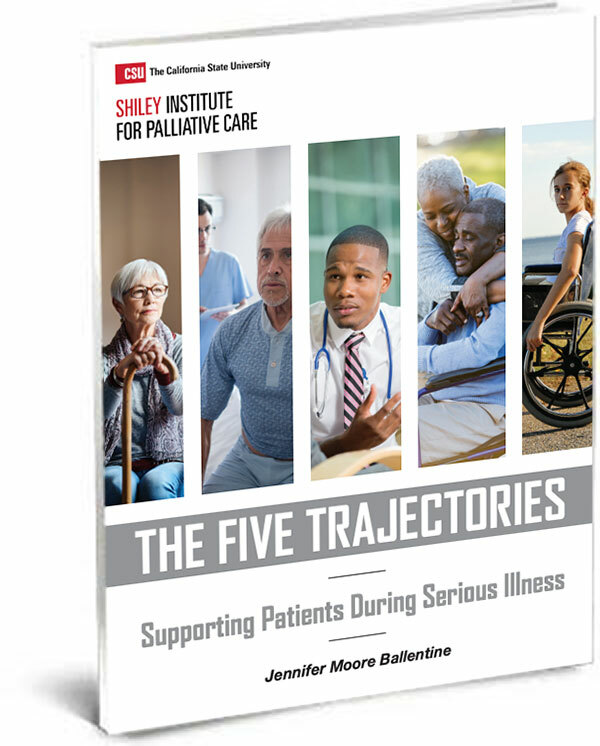 The success of your palliative care program is too important to rely upon guesswork and hunches to select the patient population, geographic service area, and model of palliative care. This course teaches you how to conduct a thorough needs assessment that details the specific palliative care needs in your community. Written by Kathy Brandt, MS and Helen McNeal, BBA, the course includes numerous useful tools, and strategies to help you conduct the assessment and present your findings to your leadership and potential partners. 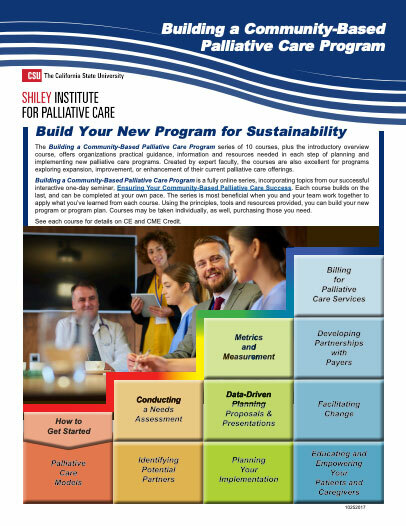 Written by healthcare consultant Kathleen Taylor, MA, LMCH, this course will deliver content including specific ways partnerships can enhance your palliative care program, how to evaluate potential partners, ways to strengthen current partnerships, and the best approaches for your organization to measure the return on your partnership investment. Measurement and Metrics for Palliative Care is a 4-hour course designed to orient clinical and administrative leaders to the concepts and methods for evaluating palliative care programs. The course describes a measurement model that is designed specifically for palliative care, based on evidence-based measurement frameworks used broadly in healthcare. Course faculty Kathleen Kerr, BA, and Brian Cassel, Ph.D., consultants and experts in program measurement and evaluation, walk through the five steps of selecting appropriate and feasible measures and introduce you to a unique tool, the “Palliative Care Measure Menu.” Get the assistance you need to simplify the process of identifying and selecting an appropriate set of metrics for your program. Creating Data-driven Proposals and Presentations for Your Palliative Care Program will equip you with techniques for creating effective, successful proposals and presentations. The course is built around two core concepts – first, “thinking backwards from the story you want to tell,” and second, maximizing your use of data-driven insights about the current and future states of healthcare in your institution or setting. Use this course to help you achieve your goal of creating, sustaining, expanding or improving your palliative care program. Once the decision to launch a community-based palliative care program is made, numerous systems and processes must be put into place to ensure that the program’s goals can be met. Planning for Implementation of Your Palliative Care Program will guide you through the essential infrastructure elements, providing information, examples, resources and templates to help you build a solid foundation for your program. Do you know how to maximize billing opportunities for your community-based palliative care program? Palliative care billing experts Jean Acevedo, LHRM, CPC, CHC, CENTC, and Janet Bull, MD, FAAHPM provide in-depth instructions so you can correctly code advance care planning, chronic care management, transitional care management, and other palliative care billing opportunities. The course also includes a downloadable Excel budget template, based on Dr. Bull’s successful community-based palliative care program at Four Seasons, a tool you can use to create your budget. Medicare reimbursement is likely insufficient to generate the revenue you need to grow your community-based palliative care program. Torrie Fields, MPH, an expert in payer/provider partnerships has written this course to inform you on techniques for leveraging value-based metrics to develop contracts with payers that can grow and sustain your community-based palliative care program. The course teaches you how to create a compelling case to payers to secure reimbursement for your services. You will learn to differentiate between the incentives and reimbursement structures allowable under commercial, Medicare, and Medicaid health plans. Offering palliative care in the community challenges organizations and employees to think and operate in a different manner. No matter the size or scope of your organization, it is essential that you facilitate an effective at transition to a community-based supportive care approach. This course explores the organizational change process needed to integrate palliative care throughout the organization. Best practices related to creating and sustaining change will be shared along with exercises and tools that you can use to prepare for and support the launch of your community palliative care program. Although providers may inform patients and families about palliative care and its benefits, information may not be what’s needed to help a person make decisions about or ask for palliative care. This course teaches you how to develop effective messages about the benefits of palliative care, and recognize when patients and families are ready to hear the messages within the context of stages of readiness. Improve your patients’ access to care and quality of life by impacting them at the right time to consider palliative care. The Doctors Company designates this activity for a maximum of 23.5 AMA PRA Category 1 Credits™. Physicians should claim only the credit commensurate with the extent of their participation in the activity. Learn More About this Series!